Every ten years the Census reapportions congressional representation, shifting both seats and electoral college votes. Most changes are seen coming well in advance of the census, but occasionally a seat or two shifts unexpectedly. 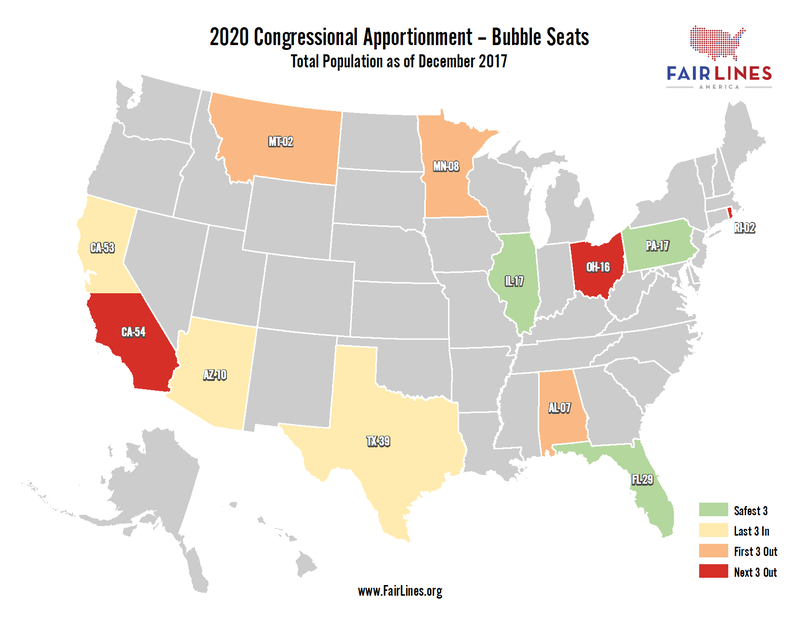 Fair Lines America has identified 12 seats currently on the bubble for apportionment. We have determined these 12 seats by calculating 60 priority values for every state. After allocating 1 seat to every state the top 385 priority values and their corresponding seats were then tallied to yield our projections for 2020. For more on computing seat allocations see the U.S. Census Bureau’s post Computing Apportionment. Based on Fair Lines America’s calculations, the twelve seats listed below are the ones forecast to be either the final 6 apportioned or the first 6 left out following the 2020 Census. Fair Lines considers PA-17 (777,781), IL-17 (771,394) and FL-29 (770,681) the safest three in, filling seats 430, 431 and 432. The last three in (seats 433, 434 and 435) are AZ-10 (770,098), CA-53 (766,894), and TX-39 (766,186). TX-39 is expected to move up the chart in December, while IL-17 and CA-53 may drop below seat 435 before the end of 2020. If CA-53 falls, it would mark the first time California lost a seat since it was admitted to the Union. Seats 436, 437 and 438 are currently held by MT-02 (763,750), MN-08 (761,686) and AL-07 (757,336). These seats stand to gain if IL-17 and CA-53 continue to decline. After coming close in 2010, Montana is again on the verge of regaining MT-02. The last seat in in 2010, MN-08, now sits at 437 and looks to be trending down. AL-07 is set to fall further out of this column in December. The next three out (seats 439, 440, 441) are OH-16 (757,102), RI-02 (752,734), and CA-54 (752,559). All three have trended down over the past ten years and may all be replaced by other rising seats in the next two years. 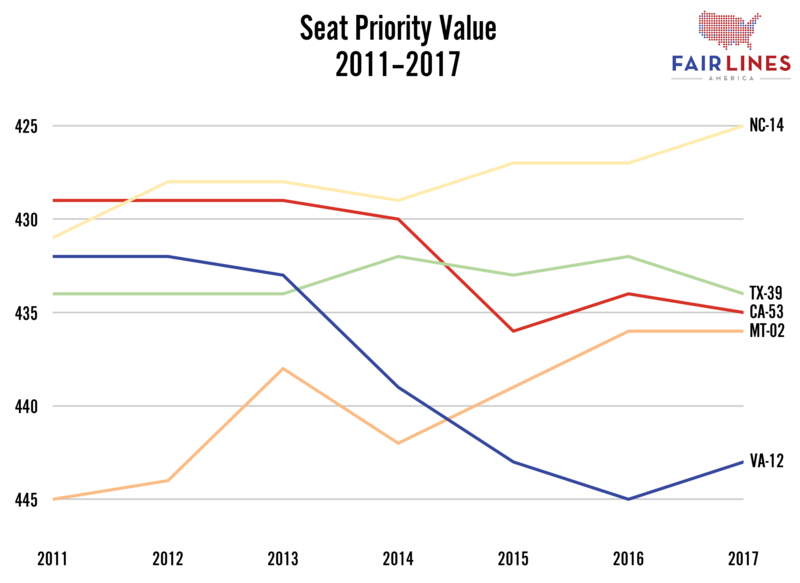 Fair Lines estimates the dividing priority value between seat 435 and 436 will be about 765,000 in 2020. In 2010, the 435th priority value was 710,231 (MN-08). The 436th was NC-14’s 709,063. Fair Lines has run forecasts for the 2020 reapportionment for every annual population estimate release. If released in 2011, estimates run for 2020 would have shown NC-14 as seat 431, one of the safest three Bubble Seats. As it is, NC-14 is now comfortably at seat 425 and will likely continue to climb. Likewise, MT-02 has gone from seat 445 in 2011 to 436 today. Conversely, VA-12 and CA-53 have trended downward since 2010. CA-53 started at No. 428 but has dropped six places and may become California’s first Congressional seat loss. Earlier this decade, the reconstitution of VA-12, a seat that has not existed since before the Civil War, seemed a certainty, but the collapse of population growth in the commonwealth has made it significantly less likely. At No. 431 in 2012, VA-12 has fallen to No. 443.